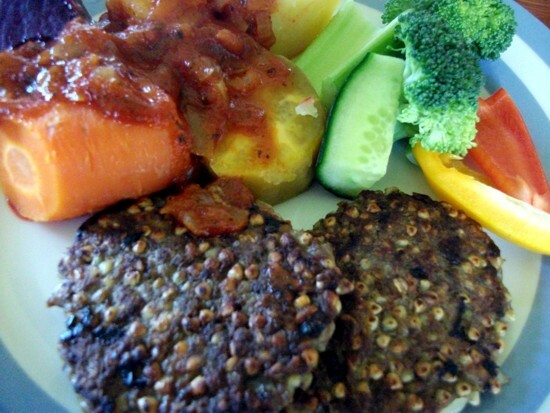 The hamburger patties recipe is quite versatile. Pair them up with steamed and raw vegetables topped with a yummy tomato sauce or use it on a sandwich to fill your lunchbox. Baked with a covering of cheese, layered with salad and condiments between burger buns these patties make great homemade hamburgers. They are fit to be served for any occasion. Measure the buckwheat seeds and take a quick look as sometimes small stones can hide in the grains. Then soak them for four hours or longer in water. In a bowl use a spoon to mix the ground beef and the drained and rinsed buckwheat together with the lightly beaten egg. Fold the peeled and finely diced onion and cloves of garlic under. Season with black pepper, salt and mild chilli! So that the mass will stick together when frying the meat patties add one and a half tablespoons of buckwheat flour. Make sure everything is mixed together well. Heat in a pan a teaspoon of coconut oil for frying the patties on medium heat. Add more as needed! Take a heaped tablespoon of mass for one burger (increase the amount if you would like the patties larger). Flatten the patty either with a spoon or with your hand. Then put the tablespoon of mixture into the hot oil and fry on medium heat. Wait for about 3 minutes before attempting to turn the patty. Depending on the size of your pan three or more patties can be cooked at the same time. When cooked through pile them on a plate that can be kept warm in the oven at 50C°. Please return if you have given this hamburger patties recipe a try and let us know how you got on with it and how you liked them.